Even if you’re not a mountain climber, you’ve probably heard of rappelling (a.k.a. abseiling) before. This technique allows you to descend from high places in a controlled manner, using a rope or cable with a friction device that slows your descent. 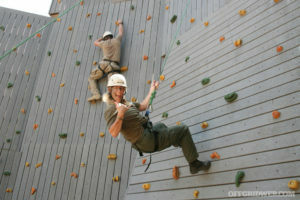 Outside of the climbing world, you’ll often see military and rescue personnel rappelling from ledges or helicopters. James Bond also does it on the silver screen. Pull the red tab to reveal the harness, then put on the backpack and tighten the straps. Descend out of the building facing the wall. The Controlled Descent Device (CDD) will lower you at a safe rate of 3 to 6 feet per second.